South African Tourism (SA Tourism) is a member of the Event Greening Forum (EGF). It has committed to making its events sustainable with the EGF’s support – such as its multiple Green Award winning business tourism show, Meetings Africa, and, as of this year, its consumer tourism show, Africa’s Travel Indaba. EGF member Earth Probiotic Recycling Solutions provided the full composting solution for Meetings Africa. 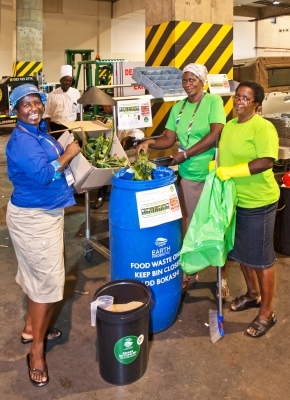 Karen Heron, who co-founded the company, explains that they provided bins to collect the organic waste – both in the kitchen and in the food service areas – as well as a composting activator called Bokashi, training for the staff to deal with the waste, waste collection and weighing, composting, and a wet waste report. Using the Bokashi system, Earth Probiotic can compost all food waste including cooked and uncooked meat, bones, fish, dairy, fresh produce, grains etc., as well as compostable food containers, wooden utensils and serviettes, and flowers and plants. The Bokashi is the magic ingredient that ferments the waste to speed up its breakdown, and ensures that the bins don’t smell. It’s also what makes it possible to compost some organic waste that usually can’t be composted, such as meat, bones and dairy. “Composting takes between 6-10 weeks depending on climate, water and frequency of turning the material. If the client does not request the compost back, we use it for projects we may be working on. 1 000kg of food waste composts to about 300kg of compost,” says Heron. The Earth Probiotic report shows that 2 502kg of wet waste was collected at Meetings Africa from 2015 to 2019. If this waste had been landfilled it would have emitted 1 569 tonnes of CO2e emissions. The report also shows that wet waste volumes have decreased over the years. In this instance, this is a positive indicator of the event’s success in reducing its food waste. “Focussing any attention on food, food waste and compostable food packaging, consciously draws attention to minimisation,” says Heron, who sees minimised wet waste volumes as one of the big advantages of their service, as this can translate into reduced costs. If you are looking for useful event greening solutions, like Earth Probiotic, visit the EGF’s Green Database: www.greendatabase.co.za.